This La Niña Likely to Have Legs | Watts Up With That? Evidence is growing this La Niña will be a longer term event. Most similar important La Niñas are often multi year events (1949-1951,1954-1956, 1961-63, 1970-1972, 1973-1976, 1998-2001). Though the easternmost Pacific near South America has warmed at the surface as the seasonal weakening of the tropical easterlies led to weakened upwelling, it is still cold beneath. Below you can see the latest depth-section of ocean temperatures (top) and anomalies (bottom). Temperature are in degree Celsius. Note the large reservoir of subsurface anomalously cold water (up to 4 degrees C) in the eastern tropical Pacific at 50 to 100 meters. Also see the latest CPC depicted ocean heat content in the tropical Pacific. This shows the heat content remains at near maximum deficit levels. These suggest as the easterlies increase again, cooling will return to the east Pacific and La Niña will persist at least well into 2008. The Pacific Decadal Oscillation (PDO) has dropped strongly negative (latest value from NCEP is -1.54 STD). This decline may represent another Great Pacific Climate Shift as the PDO warm and cold phases tend last 25 to 30 years and the last change , to a warm Pacific, occurred in 1976. See more in this pdf here. If indeed the PDO shift is the real deal, we might expect more La Niñas and fewer weaker El Niños over the next few decades with a net tendency for cooling. Add to that a quieter sun and eventually a cooling Atlantic, and you have a recipe for global cooling. However, this has its own drawbacks, La Ninas bring more drought and summer heat waves, landfalling hurricanes, large tornado outbreaks, spring floods, winter snows and cold outbreaks than their more famous counterpart, El Niño, which has dominated during the warm PDO era. A while back, Stan Changnon did an interesting analysis which I reported on recently here that suggests the era we have gone through since the late 1970s with dominant El Niños was unusually benign with more benefits than damages and will be looked on as the golden era, a modern climate optimum. Even if all this is correct, you might expect the media and enviro-alarmists ‘evidence’ we are affecting our climate to morph from warming and ice melt to the climate extremes characteristic of La Niñas. February 28, 2008 in Climate_change, Weather. As I mentioned in my post here about one of the satellite data sets (RSS) that showed a marked cooling globally in 2008, La Nina and PDO seem to be drivers of this change. Here is Joe D’Aleo’s take on it below. That correlation rang true as soon as I saw it. It’s funny. I had heard about the “30-year cycle” long before that, but being innocent of the science, I did not know that this was a ref. to PDO. The warming/cooling of the late great 20th Century certainly matched that pattern. But as I never saw it mentioned, I just let the concept slide. And here it is again. You guys (or someone around here) did mention that the last time we had a cooling it was kicked off by La Nina, right? Toss in our new “midnight sun”, and it’s a real triple whammy. So what about AMO? How long is the cycle, and what’s the swing. Does anybody know? Or is it all just a bunch of “Day After Tomorrow” science? Is AMO the fourth whammy upcoming? It’s interesting that the ocean “heating” extends below the 150m recently proposed as the mean ocean heat sink depth for Global heat capacity caused lag time constant estimation. page 10 has a chart. Looks like this LA Nina is getting stronger, not weaker. Also, La ninas last for years, instead of months like El Ninos. In a stunning development, did anyone see the Southern Hemisphere sea ice anomaly for January? ~35% above normal. Coincidence? Not likely. The ice levels and global temperature of this planet are clearly governed by the oceans far more than CO2. The last 12 months are pretty clear on that. I’m still unsure about the solar involvement. Looks like that may be more long-term where-as the PDO/AMO are more short-term. I dunno, just thinking aloud over here…. Where does all that (warm) energy go? Is it recycled into other areas of the oceans? If so, it seems to me that global cooling would not take place, since it is just a rearrangement of energy in the same space. Is it radiated back into space? It seems from the AGW theory that the increase in CO2 should prevent that. That’s obviously an oversimplification, but I’m just a simple man. Off topic, but I thought you would be interested if you were not already aware. Have you seen Lorrie Golstein’s article today in the Toronto Sun? He thanks you at the end of the article. REPLY: Thanks. I guess Suzuki will be calling for me to be jailed now. This is really bad wording on the part of DailyTech. There has been no “erasure”. This is an anomaly with a large magnitude, and it coincides with other anecdotal weather evidence. It is curious, it is unusual, it is large, it is unexpected, but it does not “erase” anything. REPLY: Sorry didn’t mean to embarrass you, just fighting to keep what I wrote in the original post accurate in the face of inaccurate reporting. Evan Jones: The AMO appears it may have started to turn, but that just may be a response to a general SST cooling, at least IMO. If you look at the curve, http://www.wunderground.com/hurricane/amo.gif the weasel word portrayers are right to some extent. It would exaggerate both heating and cooling. 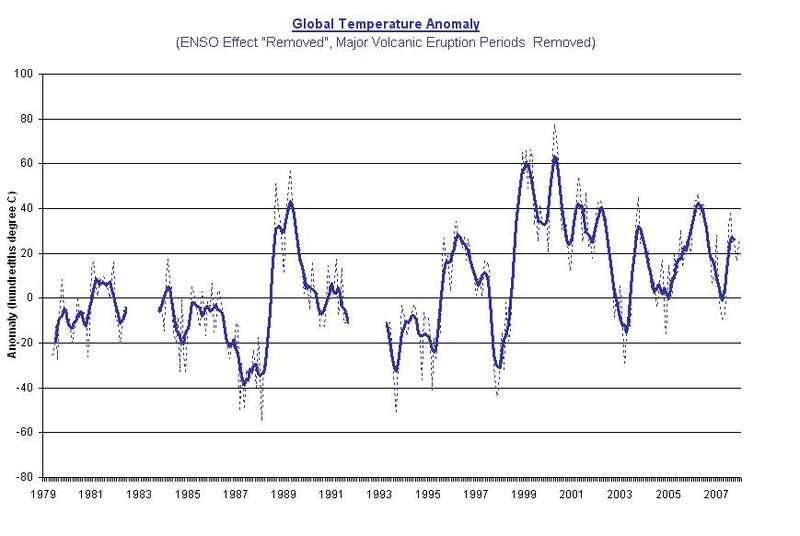 If you started your global warming study in the mid-70s, the AMO would add significantly to the rise in global temperature. If your starting point was 1900, it would still add, but not as much. Even if the starting point was 1950, it would add, but it wouldn’t be significant since the current peak isn’t that much higher than where the AMO was in 1950. Would the AMO be a fourth whammy? I hope so. In “A Signature of Persistent Natural Thermohaline Circulation Cycles in Observed Climate”, Knight et al expected the AMO to start to decline within 10 years of the date of their paper, which was 2005. Maybe it’s a little early. Request for a link: Does anyone have a link to the Pacific SST anomaly data, North of 20N, in tabular form, one value for each month since 1850? 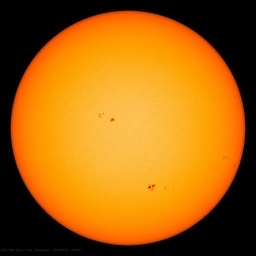 Like the standard anomaly data by Hadley Center or GISS, etc. That’s the area of the PDO. Nathan Mantua was nice enough to respond to an email full of questions, but he pointed me to data files that my PC doesn’t handle. I don’t think there is another Pacific climate shift happening. This looks more like a moderate to strong La Nina in combination with lower solar activity causing cooler global temperatures. Most likely, this La Nina will weaken in the next several months then start to strengthen again in about 6 months and will probably be a little stronger by this time next year, but not to the strength of the 70’s. Bob T., Gary G: Thanks. That’s a lot like a heat sink, huh? I inferred from LaDochy (12/2007) that if a heat sink continually exaggerates a warming trend, then, logically, it must exaggerate a cooling trend as the effect “undoes” itself. Whatever the initial warm offset would remain, of course, but the main visible delta effect is an exaggeration of trends. I am entertained to read that AMO would add (a bit) to 20-Century GW. What little I read on it came to no such conclusion. Stan: Got your message; I’ll get back to you soon. Reading Kristen’s take I’d say there’s some legacy for us after all! Woo hoo! Put me down siding with my generation, a gentlepersons’ bet mind you. My take is that the physics implies all of the heat is emitted into space via the upper atmosphere. The rates of absorption and emission of radiant energy for asphalt is >1000 times that of CO2 in the atmosphere (at our temperatures), but only >10 times at 2000 degrees Kelvin. In the first 100m above us all of the energy radiated from the ground is converted to kinetic energy, or heat, but is overwhelmingly transferred by conduction of air molecules, by turbulent convection of air cells, by evaportation of water between the surface and the atmosphere, and by condensation in clouds(transfer between the troposphere and points higher). The oceans have 2000 times the heat capacity of the atmosphere and therefore store solar energy to be released by the foregoing processes, over some years, giving us our weather. Correct me if I’m mistaken, but the .6C drop is equivalent in magnitude to the 20th century increase, yes? That must be what they are refering to. Looks to me right now, based on RSS and UAH, we’re back approximatly to where we were in the late 1970s. Which make since, becuase that was the end of the last negative PDO. I have a very interesting question if someone can answer. Where did the La Nina come from. Current, 1945 to 1979, LIA or ????. This is I think a very OT question. superDBA, you ask a good question. Generally speaking the warm waters are pushed westward and down to lower depths, where they “pile up”. There is currently a big pile of anomalously warm water in the western Pacific, particularly south of the Equator. The warmth doesn’t go away, it is just displaced away from the surface and the atmosphere. You can see the blue line rising, which means that the warmth is accumulating in the western Pacific. At some point the winds will weaken and the warm water will spread eastward. That increased exposure will release heat to the atmosphere and space (“El Nino”). A little-realized fact is that La Nina is actually a net warming experience for Earth (cooler atmosphere but warmer subsurface ocean) while El Nino is a cooling experience (warmer atmosphere but cooler subsurface ocean). But there’s something interesting in this. One line of conjecture is that, during a cool-phase PDO, the cold deep water mixes upward to a greater extent and cools the upper ocean (at the same time warming the lower ocean – all things must balance). This greater involvement of cold deep water might put the upper ocean, and the planet, into a multi-decadal period of upper-ocean and atmospheric cooling. That’s a $64,000 question – are we entering a multidecadal period of increased deep-ocean upwelling and mixing? I agree it’s a tough La Nina. But I also have to consider that the PDO half-cyle is supposed to last for 20-30 years. And this one’s pushing 28. (And didn’t La Nina help kick off the cold PDO phase back around ’49-’51?) So how long do you figure this PDO will swing warm? <cite?Correct me if I’m mistaken, but the .6C drop is equivalent in magnitude to the 20th century increase, yes? With regards the PDO prior to the late 70s in Canberra and along the great dividing range (Australia) we had very cool snowy conditions. Post the 70s switch it became warmer and drier with hot summers. Talking to the older locals in the mountains (I have recently bought a farm there) they say that the weather has become very much like it was pre late 70s – long cold snowy winters and very mild summers (in Sydney they have been saying this February has been one of the coldest on record – I dont think we had a day over 30c whereas back in the 80s temps in the 40s were common. The local fireplace guy also said in the last couple of years sales have skyrocketed as temperatures plummet (new record cold for Goulburn and surrounds). Where I have the farm we got down to -14c plus wind chill which is unusual for somewhere not that far from Sydney. REPLY: Thanks for the suggestion. This article was copied from http://www.ICECAP.us as is, and he didn’t use them, probably becuase his web page has trouble with special characyers. I know, all my degree symbols for any articles poste dthere get truned in ? marks. But I’ve edited the article now with the correct ñ in the correct places. There is a keyboard shortcut for making those ñ letters, like the one of ALT + 0 1 7 6 on the numeric keypad with numlock on for doing the degree ° symbol. Memorize it, use it. I will. You sure we’re not looking as a phase shift? The SOI index is really high…. Those are all negative phase years, yes/no? to get a Spanish tilde. Then they can hit “n” to get an ñ or “a” to get an ã (if they write in Portuguese), etc. I am thinking about this as an energy budget. If the energy were being released to space, I would think that there would be at least a slight increase (and maybe temporary) in atmospheric temperature, perhaps lagging the drop in ocean’s surface temperature. If the energy is redistributed to the deeper ocean layers, then I guess that is one place we don’t measure well, and perhaps the energy budget is maintained. One thought that I had: If the energy is still at the ocean’s surface, but merely redistributed east to west, does this sudden cooling in the “global mean” indicate that the “global mean” measurement is not really global, but heavily weighted in some regions of the globe (North American temperatures). I hope that makes sense. Ah, I have the mental picture now. The winds push the warmer water west into a tighter and tighter area, much of it forced subsurface. The decreased surface area has less ability to affect the atmospheric temperature. Well, I told you I was simple! So I do not think the SOI record supports the possibility that there has been another Pacific climate shift. ENSOs are based on anomolies. The average temperature has been rising so a large variation today would cause a lower cold anomoly than it would in the past – assuming that the base period does not change over time. Is it possible that the lower ENSO indexes actually represent as large a deviation from normal as in the past but it is masked by the choice of base periods? 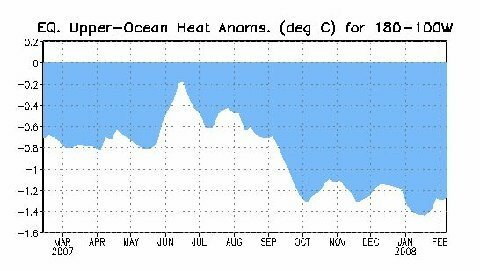 It looks to me that La Nina is breaking up and the February early temps are increasing from the January temps. The 30 day anomaly from the CDC (as of February 27th) shows colder than normal temps for the past 30 days but these are less extreme than those of January. The 7 day anomaly shows the majority of areas are now above normal. The El Nino / La Nina animation of the past two months appears to show some weakening of La Nina conditions over the past month or so. So, it appears to me that the past 12 months of very significant cooling is now over. Davidsmith1, I have come across a couple of references recently to increases in ocean up-welling. One was off the coast of Morocco. The increase was surprisingly large, 30% from memory over 3 or 4 years. I am not aware of any explanation for this increase. Nor I am aware of any systematic attempt to measure up-welling on a global basis. I understand these up-welling currents are part of the ocean heat transport from the tropics toward the poles. So more up-welling would mean more heat transfer poleward. What effect this has on climate is anyone’s guess. It also leads to the paradox of warmer temps toward the poles causing the Earth to lose more heat. First, I have no faith in the surface temperature record (my volunteers did 26 stations for Anthony), but all surface temp records (GISS, HADCRUT, NOAA, NCDC) and both satellites show a lot of cooling in the past year, so I am not sure if average temperatures have been rising. I suppose if you average them out over decades it may be warming. As for the anomalies, I do not recall the base periods changing over time, but that may be a better question for Steve McIntyre since statistics are his specialty (and I have been so involved with school that I am rusty on the subject). However, all of the temperature records, both surface and sat, have been behaving exactly as I would expect given the La Nina that has developed during the past 12 months. One thing I have noticed though is that the temps this year are a little cooler than past La Nina’s of similar strength, that is probably from the lower solar activity. It depends on the Nino region. Nino 1+ 2 is mostly controlled by high-pressure systems in the south Pacific near South America; this is something one of my volunteers has been watching very closely. The high-pressure systems in this area have been weakening lately causing the Peru current to slow down (the Peru current brings cool water from the tip of South America, as well as cool upwelling water along the coast of South America, up to the equator). This appears to be seasonal, the farther into the southern hemisphere summer, the warmer the water down there, which causes high pressure systems to be less dominant. High-pressure systems in the southern hemisphere create surface winds that blow in a counter clockwise direction. The weaker the high-pressure system in that area, the weaker the surface winds that blow surface water north along the South American coast. If you look at the Nino 4 region, that area is more affected by oceanic Kelvin waves. As the trade winds become stronger, they blow warm surface water to Indonesia. The warm surface water evaporates leaving saltier, denser (heavier) water near Indonesia, this water sinks, moves a little east, then rises causing a warm wave at the surface. Since there is no coriolis effect at the equator, this warm water can move east along the equator. This is a major part of the thermocline. If the trade winds above are weak and there is a strong Kelvin wave, you will get an El Nino. 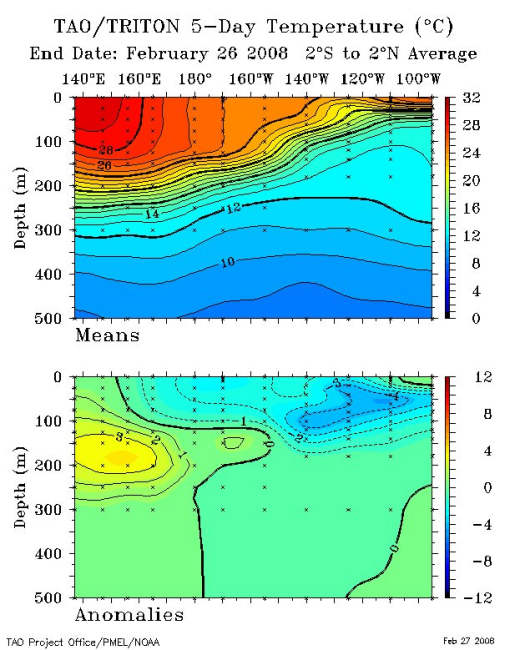 Lately the trade winds have been strong and they have prevented the Kelvin waves from moving much to the east, but at the moment there is a strong upwelling so you should expect the Nino 4 region to warm a little in the next few weeks. In an earlier post I said that this La Nina will probably weaken a little then strengthen in about 6 months or so. This is because cool surface water is being blown from Baja California to the equator south of Hawaii. This seems to be contributing to the current La Nina. But the important point is that past La Nina’s did not last more than a year unless this condition existed. If you guys want some really good stuff on ENSO I suggest the following links. There is a lot of good stuff there, especially if you go down to the “expert discussions” section there is a weekly PowerPoint presentation that is really good. There is also a link in the left hand frame on that page on the MJO, they also have a weekly PowerPoint presentation (and PDF) that will help you with MJO which affects ENSO if you have the time to learn it. For tracking daily sea level pressure and surface winds I suggest this link by the Australian Bureau of Meteorology. There is also a lot of other stuff there if you have the time. 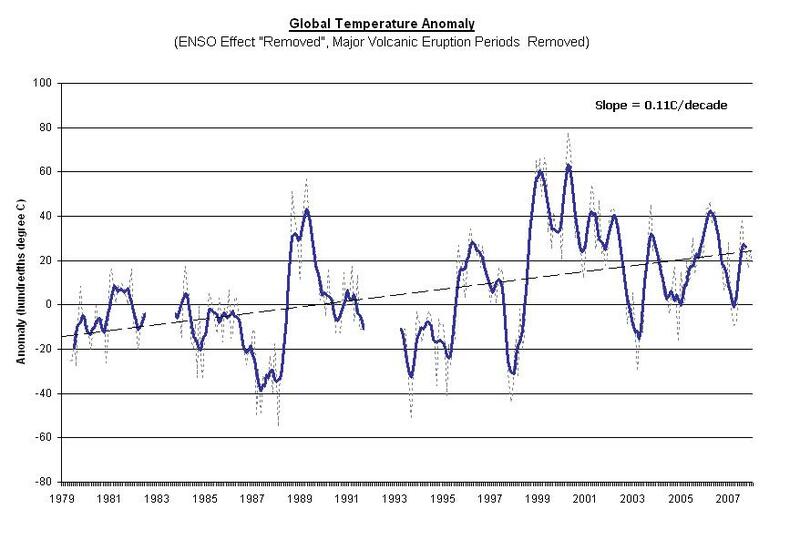 What the plot does is to allow an eyeball guess as to the direction of global temperature, ignoring the swings of ENSO and impacts of volcanoes. To me it shows that global temperature anomalies peaked around 2001 and have been on a flat-to-decling trend since. It’ll be interesting to see how 2008 “scores” as the year progresses. To me, the January 2008 anomaly looks normal for a La Nina. Philip_B, doesn’t that mean that the heat is going to Africa instead the poles? Dave, neat plot. Can you put a trend line on it? Also, another one I’d like to see is a plot of all the minimums, only the points where the raw global average chages from cooling to warming. To my eyes the global temperature anomaly was flat from 1979 to the early 90s, then rose about 0.2C over the next 5 to 10 years then became flat again. 1.1C per century seems like a downright sane number. People are forever calling this cooling a localised La Nina in the pacific. Well that may be the focus but surely if Baghdad sees its first snow in all recorded history we are not looking at simply a localised La Nina. Look at this piccie … is this just a La Nina? Check the Indian ocean surface cooling and see that it is in the tropics and mainly on the equator like the pacific cooling. Check also where the warmer surface is being pushed ….i.e to the higher latitudes and its leading edge is not unremarkably the warmest. Does anyone get the picture of what’s happening? As there has been a predominance of El Ninos over the last 30 years, (I have read 1 every 2 years instead of 1 every 7 years pre late 70`s) could this in itself raise global temperatures, if so by how much.